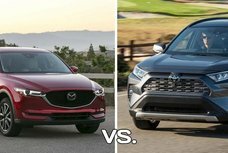 Everest vs Montero, which will you go for? Let our comparison review on Philkotse.com help you decide. The Ford Everest and Mitsubishi Montero are among most popular pickup-based SUVs in the Philippine car market. In fact, these two SUVs have been flying off the dealership lots for recent years. Amazingly, in these rugged models, you will see goodies which exclusively come in luxury vehicles. Not only featuring admirable off-road capabilities, the high-tech duo is also offered with state-of-the-art infotainment system and safety devices. Ford Everest vs Montero Sport, which is better? Let’s find out the answer in our comparison review by Philkotse.com. In passing, sometimes another representative of Japan also joins this head to head. It’s the Toyota Fortuner. 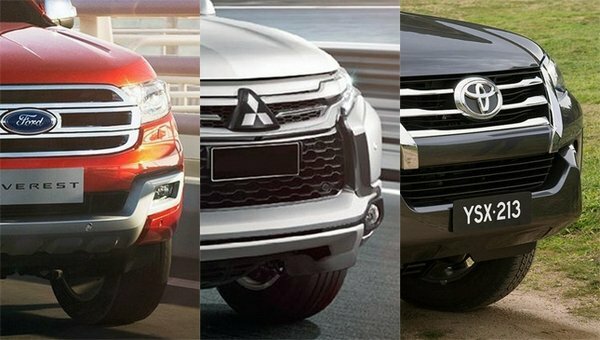 If you’re a big fan of mid-size SUVs and are really interested in the trio Everest vs Montero vs Fortuner, consult the following links to make your own comparison. To begin with, the Mitsubishi Montero Sport is powered by a 2.4-liter 4-cylinder turbo diesel DOHC 16V engine with MIVEC delivering 181 PS and 430 Nm of torque. In particular, the Montero is the first ever mid-size SUV to feature a variable valve timing (VVT) engine technology developed by Mitsubishi. This is also the only engine option for the vehicle. 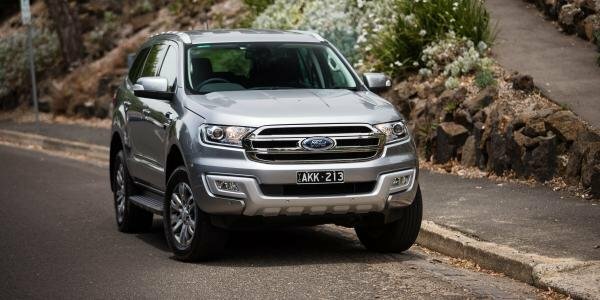 In the meantime, the Ford Everest is available in two engine options. One is a 160 PS/385 Nm 2.2-liter 4-cylinder Duratorq TDCi turbo diesel engine seen under the Ranger’s hood. The other is a bigger 3.2-liter 5-cylinder unit which is well capable of 470 Nm of torque and 200 PS. These guys all have two transmission options: 6-speed manual and 6-speed automatic; and even get the same suspension system. Accordingly, they stand on a double wishbone front suspension while the rear is equipped with a multi-link rigid axle with coil springs. Nonetheless, the top-end Montero distinctively features an 8-speed automatic gearbox with Sports mode. Beyond that, the Everest and Montero are both four-wheel drive vehicles. 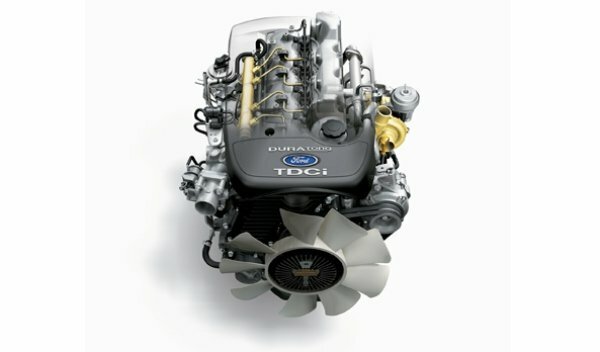 The 4WD system of the Everest receives an advanced Terrain Management System from Ford. The Blue Oval also lets customers select different variants in 4WD depending on specific driving purposed and conditions. Not to be surpassed, that of the Montero is given a Super Select II electronically controlled system with numerous driving modes like mud, sand and rock together with low-range gearing. Additionally, rear-wheel drive models are also attainable for both cars. Interior-wise, even the entry-level Mitsubishi Montero Sport is fully fitted with standard equipment such as a multi-information display, a multifunction steering wheel and dual zone automatic climate control. 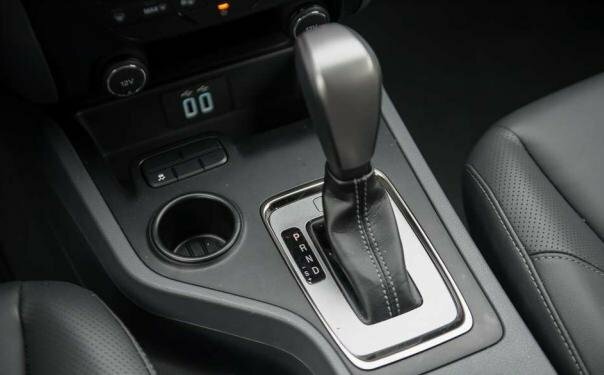 While manual trims have got conventional handbrake, the automatic ones is spoiled with an electronic parking unit. 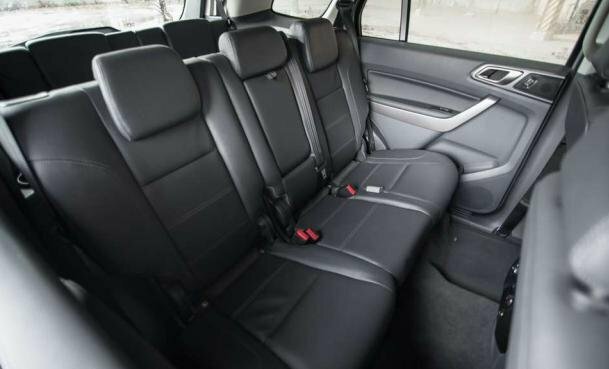 In the higher-end grades, leather seats with power reclining and sliding for both driver and occupants are ready for use. Notably for the third row, a tumble-forward system is furnished to stow the seats away. Not only that, a power sunroof makes the top-of-the-line trim one-off in the lineup. The Ford Everest, meanwhile, welcomes you with a luxurious but functional cabin. Like the Montero Sport, all variants of the Everest are loaded with a multi-information display and a multi-function steering wheel. 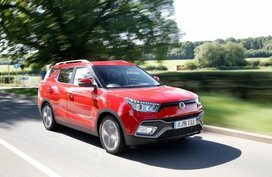 However, the base models just come standard with a manual climate control whereas mid- and top-spec trims is coddled with an automatic unit and power seats. To fold seats at the third row down for more cargo space, you just need to pull a strap and push them down to the floor. What’s more, a Premium package including a dual-pane moonroof, a power liftgate and power-folding third-row seats is also obtainable for an extra cost. Regarding infotainment source, low-spec Everests is armed with a 4.0-inch color screen while the rest of the family is indulged with a larger 8.0-inch touchscreen compatible with Ford’s SYNC 3. As for the Montero Sport, the cockpit seems to be less high-tech than its rival. 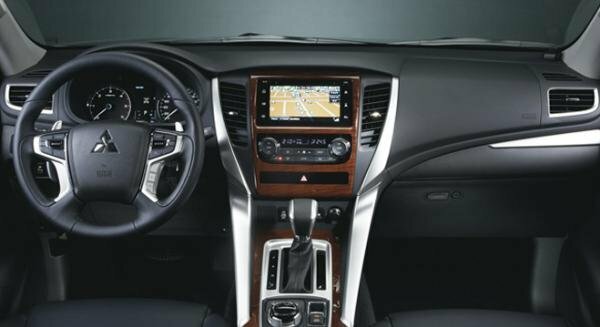 All models have a 6.75-inch touchscreen that thankfully supports all main functions as the Everest’s. Particularly, smartphone display pairing is likewise part of the infotainment system, which performs as TV function. Speaking of exterior design, the Japanese representative is dissimilar from its pickup sibling – the Mitsubishi Strada. 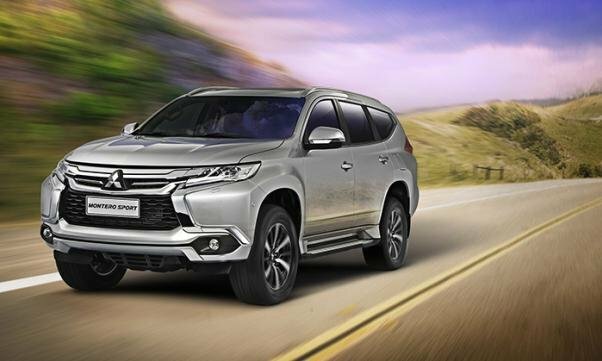 Adapting Mitsubishi’s signature “Dynamic Shield” design language, the Montero Sport is alluring with a sharp single-piece chrome front grille running from the top of the headlamps to the lower air intake. Side profile is adorned with a curved window line, two distinct character lines along with squared-off wheel arches. Completing the outer look is a special taillight treatment at the rear. On the other hand, the American peer is dominated by the façade of the Ford Ranger. It’s decked with a 3-bar hexagonal grille flanked by halogen or HIDs with LED DRLs depending on each variant. Distinctly, a more upswept window line and a couple of doors both belong to the Everest, not the Ranger. Backwards, the SUV is complemented by elongated hexagonal tail lamps and a single chrome bar. 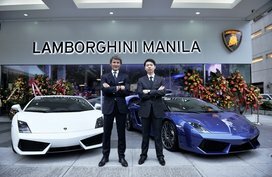 As informed, the Everest and Montero Sport are high-tech models. Alongside the advanced driving systems, they’re also loaded with a host of up-to-the-minute safety features, especially systems that might prevent accidents in the first place. 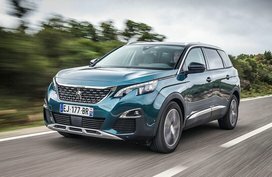 As well as that, the Premium models are further equipped with Blind-spot Monitoring, Lane Keep Assist, Active Park Assist, and Forward Collision Warning. Not to be outdone, standard safety kit in the Montero Sport contains Trailer Sway Control beside basic features. Higher-end variants are offered with stability control. Hill-Descent Control, Forward Collision Mitigation System, Brake Override System, Blind Spot Monitoring and Reverse Sensors are offerings to 4WD models. 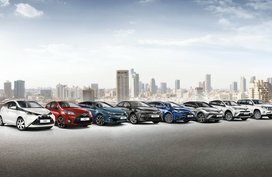 If these big workhorses are of interest to you, it is appropriate that you schedule a test drive at your nearest dealer to get real driving experience. Ford Everest vs Montero Sport, who wins the battle? Frankly speaking, this head to head is drawn. Our comparison review is just a reference to you. So anyway, everything depends on you. In actual fact, both two high-tech heavy hitters have been a success for their brands. 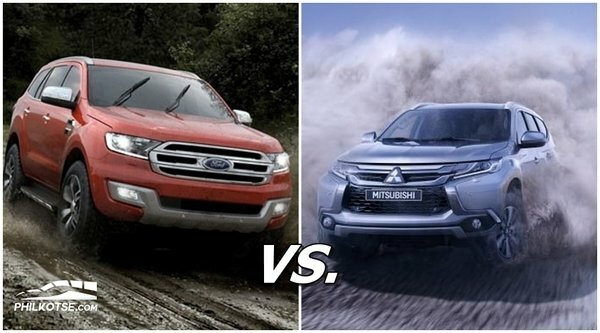 Ford Everest vs Montero, who wins the battle? Finally, we fervently hope that you will find our befitting car soon!